No nation can be greater than the strength of its individual homes or the virtue of its people. Sadly, many today would say ours is a nation in crisis. Families are splintering around us, our children are becoming alienated from their great cultural heritage, and our leaders seem increasingly out of touch. Yet, according to Gordon B. Hinckley, president of The Church of Jesus Christ of Latter-day Saints, one cannot lose hope. The solution lies not within our government, schools, or symbols of popular culture, but rather within ourselves, our families, and our faith. 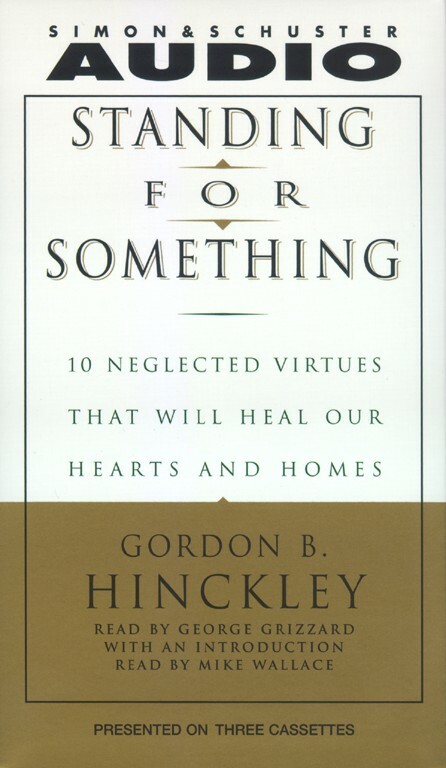 In the tradition of William Bennett's Book of Virtues, Hinckley has created a classic look at the values that can change our world -- and how to stand up for them. Drawing on anecdotes from his own life, as well as from our nation today, he examines ten virtues that have proven through the ages to provide the most profound path to a better world: love, honesty, morality, civility, learning, forgiveness and mercy, thrift and industry, gratitude, optimism, and faith. Standing for Something is an inspiring blue-print for what we can all do -- as individuals, as a nation, and as a world community -- to rediscover the values that make us strong and by which all of us can work toward a brighter future.